How do you eliminate Catholic Belly Fat? Go to Mass and genuflect (I hear it’s the earliest form of Pilates), fast, eat bread and wine and read Foraging Squirrel because it’s good for the body and soul. Avoid as many processed foods as possible. Drink 8 glasses of water day. Laugh- watch comedies, stand up, play with your kids, read funny books. Every time a negative thought comes your way say “delete that thought” and replace it with a positive. Soul Food — Slow Cooker Summer Ratatouille It’s too hot to use the oven so I’m opting for the slow cooker! Layer half the vegetables in a large crock pot in the following order: onion, eggplant, zucchini, garlic, green peppers, tomatoes. 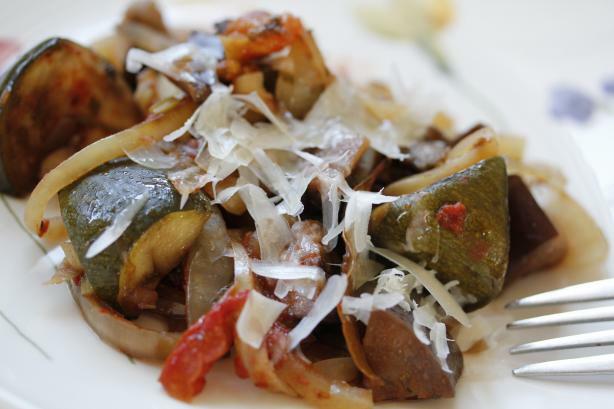 via Ratatouille In The Crock Pot Recipe – Food.com – 52757. So the fried Ravioli I had planned for tonight should be a no go?